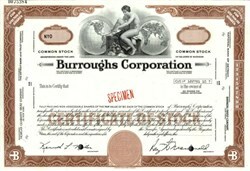 Beautifully engraved specimen certificate from the Burroughs Corporation . This historic document was printed by the American Banknote Company and has an ornate border around it with a vignette of an allegorical man sitting in between two globes. This item has the printed signatures of the Company’s President and Secretary. The Burroughs Corporation was a major American manufacturer of business equipment. The company was founded in 1886 as the American Arithmometer Company, and after the 1986 merger with Sperry Univac was renamed Unisys. The company's history paralleled many of the major developments in computing. At its start it produced mechanical adding machines, and later moved into programmable ledgers and then computers. And while it was one of the largest producers of mainframe computers in the world, Burroughs also produced related equipment as well, including typewriters and printers. Burroughs was one of the nine major United States computer companies (with IBM, the largest, Honeywell, NCR Corporation, Control Data Corporation (CDC), General Electric (GE), Digital Equipment Corporation (DEC), RCA and Sperry Rand (UNIVAC line)) through most of the 1960s. In terms of sales, Burroughs was always a distant second to IBM. In fact, IBM's share of the market at the time was so much larger than all of the others, that this group was often referred to as "IBM and the Seven Dwarfs." By 1972 when GE and RCA were no longer in the mainframe business, the remaining five companies behind IBM became known as the BUNCH, an acronym based on their initials. In 1964 Burroughs had also completed the D830 which was another variation of the D825 designed specifically for real-time applications, such as airline reservations. Burroughs designated it the B8300 after Trans World Airlines (TWA) ordered one in September 1965. A system with three instruction processors was installed at TWA's reservations center in Rockleigh, New Jersey in 1968. The system, which was called George, with an application programmed in JOVIAL, was intended to support some 4000 terminals, but even after a fourth processor was added it couldn't handle the workload. TWA canceled the project in 1970, acquiring one IBM System/360 Model 75, two IBM System/360 model 65s, and IBM's PARS software for its reservations system. TWA sued Burroughs for non-fulfillment of the contract, but Burroughs counter-sued, stating that the basic system did work and that the problems were in TWA's applications software. The two companies reached an out-of-court settlement. In September 1986, Burroughs Corporation merged with Sperry Corporation to form Unisys. For a time, the combined company retained the Burroughs processors as the A- and V-systems lines. However, as the market for large systems shifted from proprietary architectures to common servers, the company eventually dropped the V-Series line, although customers continued to use V-series systems as of 2010. As of 2013 Unisys continues to develop and market the A-Series, now known as ClearPath.